The table tennis racket has changed significantly over the years. 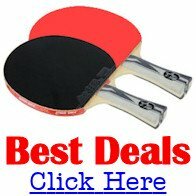 The table tennis racket has changed many times during its 120+ years of development - from the first hollow drum racket to the sophisticated sponge racket of today. But if you're looking for advice on choosing a racket today, read my articles starting here. The long handled vellum battledore, frequently called the "banjo" racket and often as long as 48cm (19 inches). Then came a short-handled hollow vellum battledore racket which superseded the long handled model. Next, a plain wooden racket which was made of different types of wood and in different thicknesses. A racket covered in sandpaper was then developed in an attempt to help players impart spin on the ball. A cork-faced racket replaced the sandpaper covered racket, and many players considered it gave improved performance. This era saw many changes to the technical specifications of the racket, and for the first time the impact of Japanese technology was experienced by European players. Firstly there was a pimpled rubber racket which had a canvas backed rubber sheet with a studded surface. The next stage was the production of an extra wide racket which had a surface of pimpled rubber. This racket was often preferred by defensive players. In the early 1950s, a waffle sponge racket was introduced. The 1950s also saw the first Japanese racket on the European market. This was a 10mm soft sponge racket. The introduction of the crepe rubber racket was next but it was unsuccessful because it gave the player little control over the ball. This phase of development saw the racket start to evolve into the hi-tech product it is today. 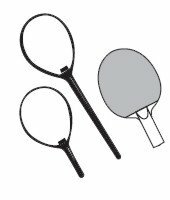 The first racket in this phase was the 1mm pimpled rubber sponge covered racket, but while this was suitable for all round play, it did impose limitations on spin. This was superseded by the 2mm pimple rubber racket which proved ideal for attacking play, but again limited spin. In terms of innovation, the next in line was a racket which was designed to counter topspin by providing a surface which would absorb heavy topspin. The maximum degree of spin and speed was produced by a racket which had a 1mm reverse rubber sponge surface. And then, for greatest control, the 1mm reverse rubber sponge racket was produced.